The Brandywine-Christina Cluster encompasses 565 square miles in parts of Delaware and Pennsylvania. It extends from the rolling piedmont in Pennsylvania to the flat coastal plain in Delaware, including the Brandywine, Red Clay and White Clay Creeks, and the Christina River. This pastoral landscape is known for its well-preserved early-American villages and historic Revolutionary War sites. It has inspired both world-renowned artists, including three generations of the Wyeth family that have become synonymous with the Brandywine Creek, and one of the oldest (and most effective) conservation movements in the nation. However, the Brandywine-Christiana Cluster is on the edge of the Philadelphia and Wilmington metropolitan areas and has experienced intense development pressure over the past thirty years. Chester County, for example, is among the fastest growing counties in Pennsylvania. Communities in this cluster struggle to balance concern for water quality with the needs of an agricultural economy and the impacts of sprawling development. Total Area 565 Sq. Mi. Sprawling growth on the edge of the Philadelphia and Wilmington metro areas compounds the water quality effects of agricultural activities that produce excessive sediment, nutrient, and bacterial runoff. The competition for land has also played out with classic results: natural habitat and forest cover have shrunk, and water quality suffers further from chemicals, high temperatures, and stormwater runoff. Streams and rivers in the Brandywine-Christina Cluster provide 100 million gallons of drinking water to more than 500,000 people each day. Some of these waterways are high-quality, cold-water trout streams (including the only trout streams in the state of Delaware). Pennsylvania ranks many of these waterways as High-Quality and Exceptional-Value streams. The natural resources of the cluster also substantially contribute to the region’s economy. They generate $1.5 billion in benefits to water quality, water supply, fish and wildlife, recreation, agriculture, forests and public parks, and they directly or indirectly support more than 100,000 jobs. Agriculture and development stress the water quality in the cluster. On farms, the lack of forested streamside buffers and other best management practices have raised water temperatures and caused erosion, sedimentation and nutrient loading. The area has also experienced intense development pressure over the past 30 years. During its peak, development was impacting 5,000 acres per year. Although the pace has slowed, residential and commercial development continues to consume land and resources. As a result of these stressors, 400 miles of streams in and around Newark, Newport and Wilmington, Delaware, as well as throughout Chester County’s rapidly developing agricultural areas are now officially “Impaired.” Yet, despite intense development, this area continues to offer important habitat for bald eagles, brook trout and other wildlife, as well as outdoor recreation for thousands of people. Focusing on headwater streams, the partner groups will deploy four main strategies: land protection, purchasing agricultural and conservation easements; agricultural restoration, taking a whole-farm approach to land and nutrient management; stream restoration, helping landowners restore impaired streams to health; and municipal innovation, promoting water quality protection through regulations and policies, low-impact development, pollutant reduction plans, green stormwater infrastructure, and separate stormwater and sewer systems. Accomplishments to date: The partners have protected 19 farms encompassing 1,244 acres with 9 miles of streams, planted 34,507 trees to create 22.35 miles of forested stream buffers, installed 8.75 miles of stream bank fencing, and implemented 185 agricultural best management practices on 44 farms. They monitored 46 sites for improvements to water quality. The partners also secured the adoption of six riparian buffer ordinances by local municipalities. Projected outcomes: Seventeen farms covering 890 acres will be permanently protected from development, and 10.5 miles of streams will be buffered. A full suite of agricultural management practices are expected to be implemented on 41 farms. Approximately 1.5 miles of streams are targeted for restoration. Dozens of municipalities will receive planning and technical assistance. Initiative organizations will monitor and assess all elements of this plan through scientific data collection as well as tracking to determine if municipalities that adopt the riparian buffer ordinance are enforcing it and whether additional land is conserved. The water-quality data collection will include water temperature, conductivity and depth; base flow, turbidity, bacteria and chemistry (including nutrients); macro-invertebrates; sedimentation; and trout populations. This data will be collected by professionals, students and volunteers. Data previously compiled by academic institutions will serve as baseline measurements of key indicators. The Stroud Water Research Center and the Academy of Natural Sciences of Drexel University will coordinate water quality sampling to ensure that participants capture the impact of strengthened regulations in Chester County. The partners are seeking to raise more than $9.7 million in funding from public and private sources, beyond the grant from the William Penn Foundation. 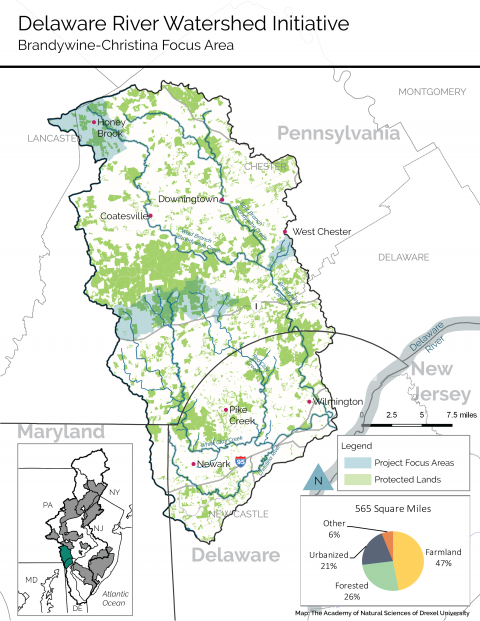 A proposed new conservation funding mechanism—the Brandywine-Christina Healthy Water Fund, through which the watershed’s downstream beneficiaries will invest in upstream land restoration and protection measures that ensure water quality—is projected to bring in an additional $1 million to $10 million. The fund will initially be managed by The Nature Conservancy with technical support by the University of Delaware Water Resources Center and guidance from all partners. Brandywine Conservancy & Museum of Art, Brandywine Red Clay Alliance, Natural Lands, Stroud Water Research Center, The Nature Conservancy of Delaware, University of Delaware Water Resources Agency.